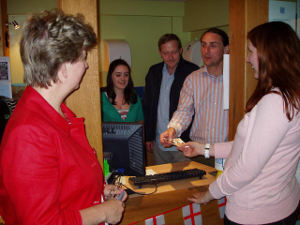 Volunteers at the cinema in Wotton-under-Edge, Gloucestershire have received training in customer services from Red Door Coaching and Training Ltd which is based in Charfield. The training was organised as part of the Cinemas continued expansion and pursuit of ever better service. The training was a mix of open discussion and coaching along with some role play and was provided by Red Door as part of a scheme operated by the Learning and Skills Council’s Leadership and Management Advisory Service. The scheme is available to any businesses with between five and 249 staff (including volunteers) and provides an initial grant for training and development of staff and further grants are available in some circumstances.